Do you know Smartydns.com? Please tell us your experience and write a short review here. SmartyDNS was launched in 2013 and is marketed as a means of unblocking media content in other parts of the world. They evolved from a Smart DNS provider to a VPN services provider that offers VPN, Smart DNS and Proxy services. At the moment, support is restricted to services located in USA, UK, Poland, France, Canada, Italy, Netherlands, Germany, Australia and Singapore, although additional servers are expected in the future. P2P is allowed on servers from Netherlands and Germany. Smart DNS does not suffer from the same speed restriction issues associated with a Virtual Private Network, it is more purpose-built for those who are looking to stream video content regularly. The SmartyDNS product works in a similar way to VPN technology, in that it obscures a user’s true location. This is achieved by re-routing DNS queries through a server in another part of the world. By doing this, the service tricks websites into thinking the user is in another place, unblocking content which is usually restricted to that region. However, there are a number of differences between Smart DNS technology and a VPN. Smart DNS lacks the encryption of a VPN, but does not require software to be installed (although optional software for Windows is available) and internet speed is not negatively affected. Moreover, the Smart DNS re-routing only takes place on supported websites, so other browsing is not affected. A VPN is not only used to bypass geo-restrictions, it also encrypts your traffic. Therefore the VPN is often used by users who want to stay anonymous online. 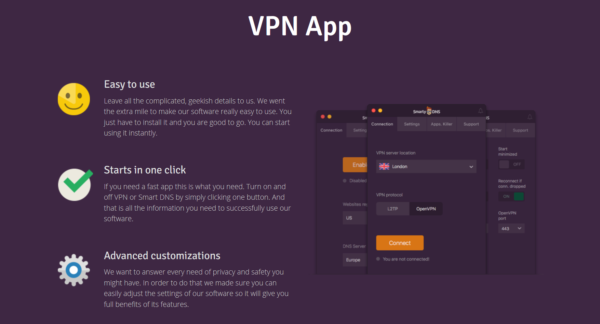 You simply have to download and install the VPN software on your computer, everything else is self-explaining. For their VPN they have 6 protocols available: OpenVPN, IKEv2, L2TP/IPSec, SSTP, SoftEther, PPTP with the strongest encryption. They offer apps for Windows, macOS, Android, iOS, Android TV, Amazon Fire TV and Amazon Fire TV Stick. SmartyDNS doesn’t keep any logs and allow 5 simultaneous connections with VPN and unlimited simultaneous connection with Smart DNS. SmartyDNS makes use of a competitive pricing strategy, with a monthly subscription costing $6.95. Customers who opt to subcribe for a longer time period will be able to receive a discount on that price, with a 3 month subscription costing $16.95 and a 12 month subscription costing $49.95. Prior to committing to a subscription, however, customers can make use of a free 3 day trial, in order to sample what SmartyDNS has to offer and make sure it works on their device(s). The trial comes with no obligation to subscribe and no credit card is required. In addition, a 30 day money back guarantee offers further protection. A wide range of payment options are accepted, including PayPal, Credit Card, Discover, Bicoin & Altcoins, Alipay, Webmoney, Yandex Money, Boleto Bancario, Qiwi. This range of choice far exceeds the payment options available for most other services on the market. Like most Smart DNS services, SmartyDNS feature an extensive support section on their website, which covers the most common queries and concerns people are likely to have before or during use of the product. In the event that a customer encounters a problem, the company advise that they consult this page first. However, if a customer still needs to get in touch with the company directly, technical support is available via a ticket-based help system within the client area, while more general questions can be sent via email. Response times are generally quick, although there is currently no telephone support but they have a live chat.